Learn about her wild adventures & her All-New Africa Series, inspired by her exciting journey! Click Play to Watch this fun & lighthearted “TeshiaArt Africa Toto/Remix Video”, created by Colby Larsen of the TeshiaArt Africa Crew! When in Africa…. Special Thanks to everyone in this awesome group! The Africa Trip wouldn’t have been possible without these amazing & talented people. Africa Unite! 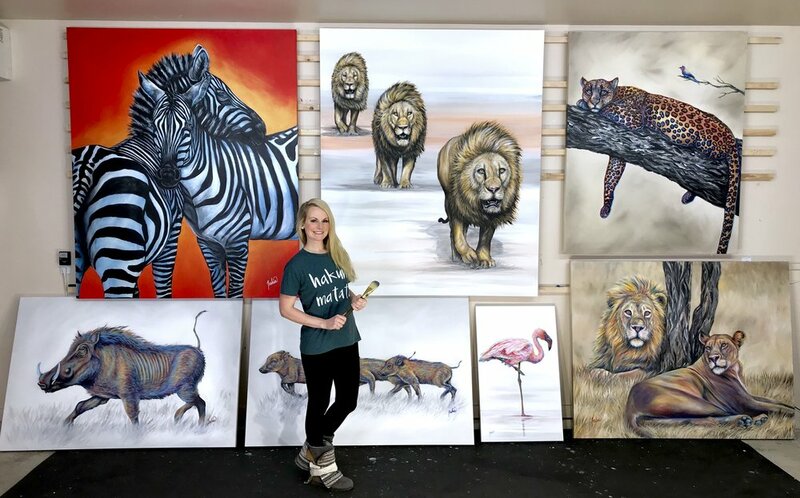 Teshia is proud to release her special African Wildlife Series, inspired by her travels, the animals she saw & photographed, and the amazing experiences she had while in Africa! 10% of Teshia’s Africa Series directly benefits the Art Elevated Giving Fund, something that is very near & dear to Teshia’s heart. Learn more about Art Elevated, & its amazing mission, below. 10% of Teshia’s Africa Series directly benefits the Art Elevated Giving Fund. This special fund was established after the Africa group visited Kensington Primary School in Kenya, where Teshia taught a painting class to kindergartners. During this unforgettable visit, Teshia & the Africa crew witnessed firsthand the lack of art supplies, amongst many other tools & learning items, that the children had access to. They had so very little, it was shocking. Nevertheless, those sweet kids welcomed Teshia & the group with huge smiles, open hearts, an eager willingness to learn, & a heartwarming enthusiasm to paint with Teshia! Colby & Sarah, owners of Park City Fine Art & part of the Africa crew, immediately heard their calling. Having the huge hearts that they do, they immediately established the Art Elevated Giving Fund among returning home to the United States! Teshia is so happy & proud to give back to this amazing organization through her African Wildlife paintings. Through her art, she aspires to help make the world a more colorful place. Hopefully going forward, many artistic & creative African children will have greater opportunity to do so as well. Providing creative outlets to impoverished schools and children; through art curriculums, mentoring supplies and projects. We believe that creating art supports mental, emotional, and physical development. Art in schools has shown to raise self-esteem, create purpose and value in children as well as develops the mind in problem solving, math, literacy and social skills. Through Art Elevated children can express experiences that cannot always be verbalized. Our mission is to raise generations who are empowered and feel valued in all of these areas. To elevate them to a next level of learning and thinking that helps them climb above their circumstances no matter what they may be.